"Whatever Happened to Jabba the Hut?" Han and Chewbacca square off against Jabba the Hutt. 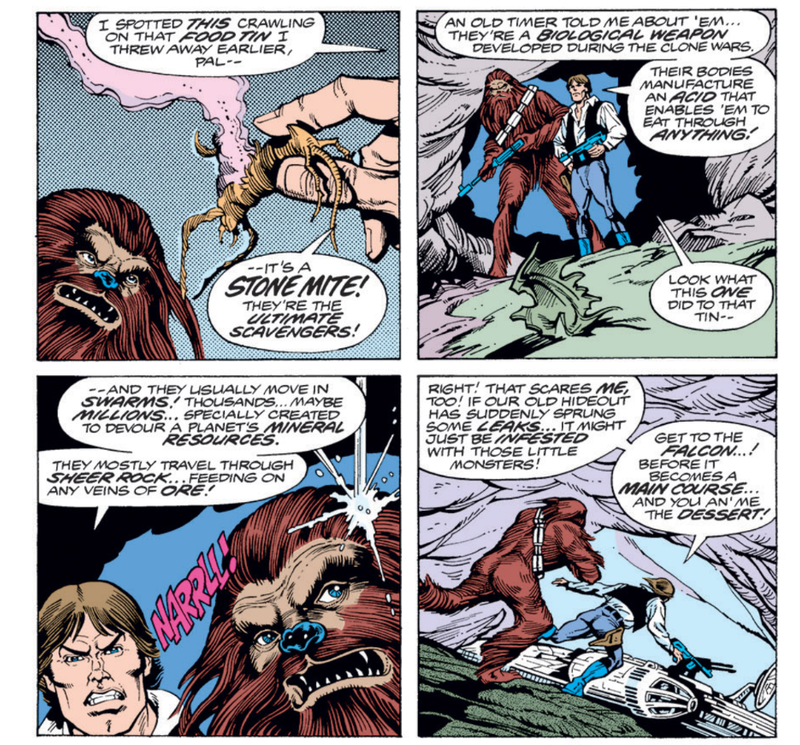 On the planet Orleon, Han and Chewbacca are trapped in a cave, pinned down by Jabba the Hutt and his goons. With their food stocks nearly gone, Han thinks back to how they got stuck in their predicament, going to ground in one of their old smuggling hideouts to effect repairs after escaping Darth Vader, only to inadvertently trip a tracking device Jabba had left in the cave in the event that Han returned there. Suddenly, Han spots something in the cave and blasts a stone mite, a scavenger which consumes metal. Just then, Jabba's goons attack again, triggering an explosion that destroys the entrance to the cave. Racing back to the Millennium Falcon, Han fires up the engines, working to remove the mites from the hull, which draws the attention of Jabba, who quickly backs away from the cave once he discovers the stone mites. Successfully managing to blast the mites off the hull, Han and Chewie take advantage of the mites having weakened the cave by eating away the metal in the rock to blast their way to freedom. Reaching space, they're confronted by Jabba's ship but learn that Jabba is the only one still alive, the stone mites having ravaged the vehicle. Han and Chewie offer to take Jabba aboard, in exchange for cancelling their debt and the price on their heads. Jabba agrees, but begins planning for another day, when he'll have the upper hand again. 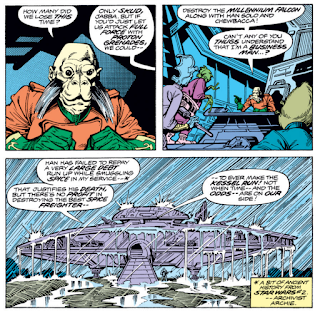 Jabba the Hutt returns, appearing in the series for the first time since issue #2 (in the scene cut from the original film and replaced in the Special Edition). He is, of course, drawn as he was in that issue and looks nothing like his later film appearances (and speaks Basic, rather than Huttese). By the end of the issue, he removes the bounty he placed on Han prior to the events of A New Hope, in exchange for Han rescuing him from his stone mite-ravaged ship. 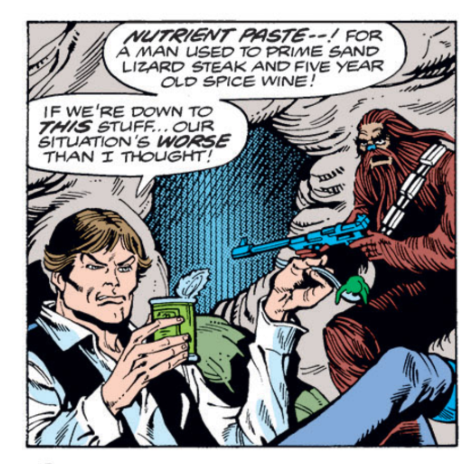 Han's dialogue on the cover is actually recreated inside the issue, something that doesn't happen as often as one would think. 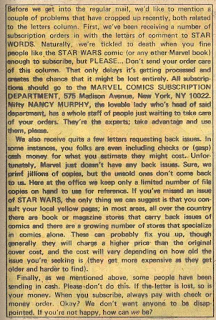 Jim Shooter is back to being credited as the consulting editor; presumably the credits template for this issue just never got updated. 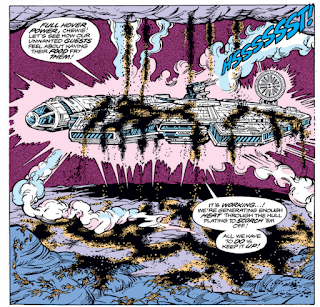 Also, Glynis Wein, the colorist for most of Chris Claremont's X-Men run, colors this issue. 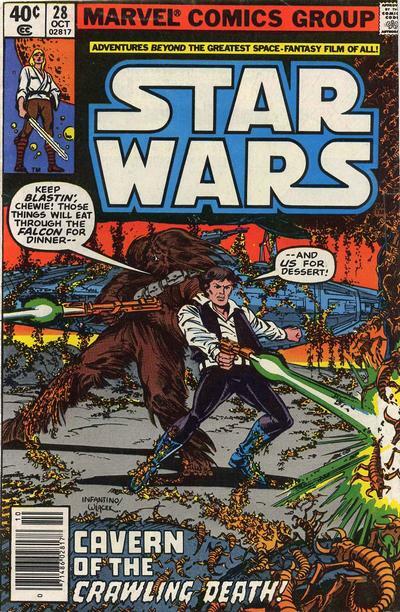 Most of this issue takes place on Orleon, a planet where Han and Chewie had holed up in the past. Jabba is shown to travel aboard a personal freighter named Voidraker. Both Han and Jabba's ship run afoul of stone mites, bug-like creatures said to have been engineered during the Clone Wars; they're basically like locusts that eat through metal. 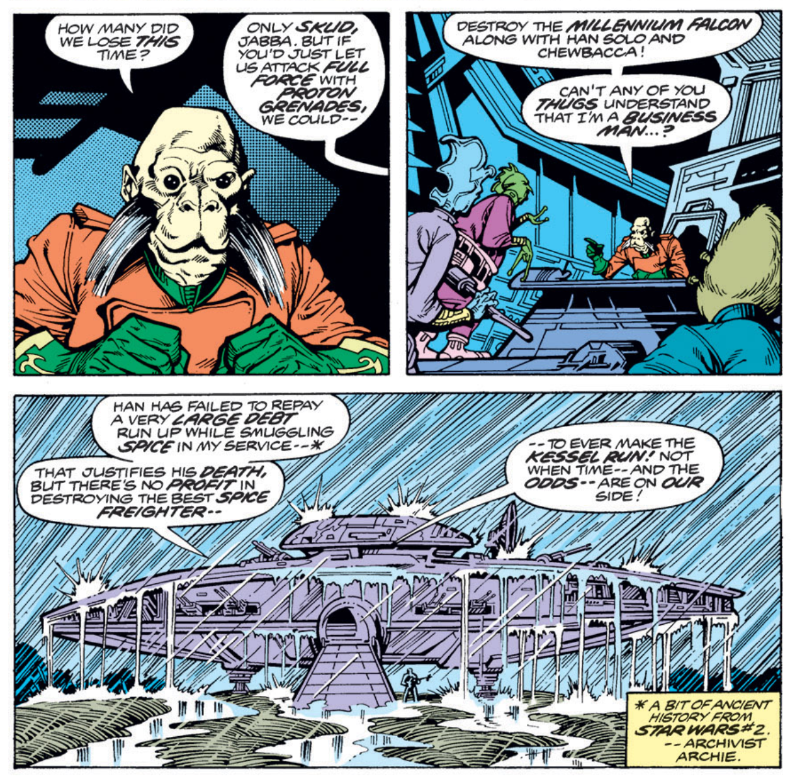 As with the next issue blurb in the previous issue, Jabba is referred to as a "Hut" rather than a Hutt. Faster-than-life travel is again referred to as "warp". 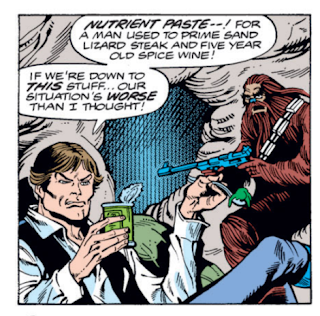 "Nutrient paste" is the default rations left on the Falcon, though Han would prefer a prime Sand Lizard steak and five year old Spice Wine. Nutrient paste comes in tin cans that look to function an awful lot like the cans modern canned food comes in. 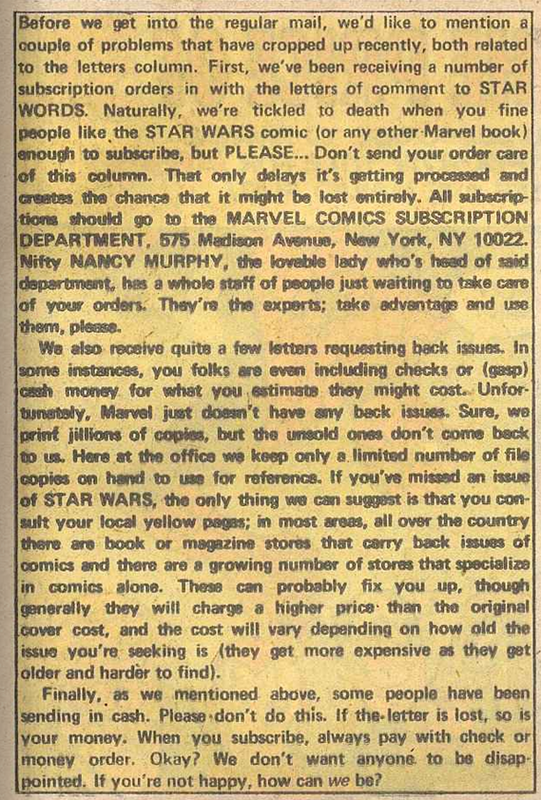 In a great case of #1970sProblems, this issue's letter column contains a brief message instructing readers not to send subscription requests to the letter department, explaining how the secondary market works (including a mention of the burgeoning direct market/comic book specialty stores), and advising readers not to send cash money in the mail to Marvel, for any reason but especially not in exchange for unsolicited back issues (that Marvel doesn't stock). Another done-in-one that manages to tell a satisfying story while still feeling like part of a larger narrative. Like the fate of the Rebels on Yavin, Han's debt to Jabba is a pretty obvious plot point for this series to follow up on, and while Roy Thomas used it as the impetus for his first original story, he never addressed it directly, and Jabba hadn't appeared in the series prior to this issue. While we know that, ultimately, something else has to happen to reinstate the bounty on Han prior to The Empire Strikes Back, in 1979, Goodwin couldn't have known that, and getting Han out from under the threat of Jabba must have too enticing a story idea to resist. Thankfully, he and Goodwin handle it well, continuing the book's recent winning streak. The return of Darth Vader, and more Valance the Hunter. Interesting that Goodwin got this story approved by LucasFilm. EMPIRE STRIKES BACK would have been pretty far along at this point, releasing less than a year later, so you'd think they would've realized that A) Jabba's bounty would still be in force in the movie, and B) The movie would end with Han getting captured, presumably setting up a Jabba appearance in the subsequent sequel. I think I mentioned this back in issue 2's comments, but I'll just restate it here: the guy called "Jabba" in this story was later officially ret-conned into one of Jabba's lieutenants instead. This story was considered to have occurred under that revision. Also, I like that "Jabba" has a guy responsible for holding an umbrella-field over his head when he's out in the rain. Good point about ESB - at this point, enough of the details would have been known to make approving this story odd. Maybe LucasFilm was too busy focusing on ESB to pay as close attention? Or they gave Goodwin the okay with the caveat that he'd need to re-establish the Jabba bounty at some point, so he wrote this knowing he'd have to undo it eventually? Is the "Jabba lieutenant" retcon something that came about via an actual story, or just something someone like Pablo Hidalgo said at some point as a means of explanation? Just curious. And yeah, the "umbrella" bit is pretty great. I only read about this guy's demotion from Hut to lieutenant on Wookieepedia. I'm not sure where it was canonized, but I'd guess maybe in one of the old ESSENTIAL GUIDE books they used to put out, or possibly just on StarWars.com at some point.